and get a month of service Free! Still using paper timesheets or Excel to track projects? Let us show you a better way. 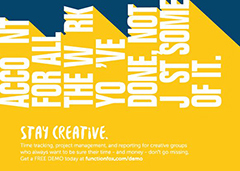 FunctionFox is the proven project management and time-tracking software designed for creative professionals. Someone you know is inviting you to try it out – without any obligation or cost. Dana Kaye - Kaye Publicity. *To qualify, you must purchase a FunctionFox subscription, and remain a customer until after your first paid month.